The Scottish Child Abuse Inquiry has announced it is to investigate a number of residential care establishments run by male religious orders. 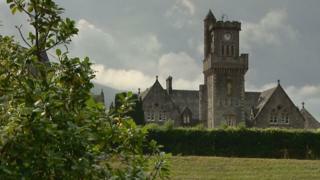 The hearings, scheduled for next summer, will include evidence of abuse at the Fort Augustus Abbey School in the Highlands which was revealed by a BBC Scotland investigation. Since then, a former monk has been convicted of physical abuse. Two others are the subject of extradition proceedings. Many more people alleged to have abused boys there are now dead. The inquiry has been looking at residential care provided by female religious orders and is about to turn its attention to charities. Its chairwoman, Lady Smith, said an investigation into male religious orders will start next summer and has called for anyone affected to come forward. The hearings will focus on the Order of Benedictines and their provision at the Fort Augustus Abbey School in the Highlands and Carlekemp School in North Berwick. The hearings will also examine the Marist Brothers and their provision at St Joseph's College, Dumfries, and also at St Columba's College in Largs. Finally, the Christian Brothers and their provision at St Ninian's in Falkland, Fife, will be scrutinised. Lady Smith said: "Investigations into establishments run by male religious orders and other preparatory work are well under way. "We have been pleased with the response to date. "We are now able to give details of the three male religious orders and their establishments we will have a particular focus on. "Please would anyone who has any relevant information about any of these orders and schools contact the inquiry." The judge said those who come forward will be fully supported. She added: "It does not matter whether you have already made a report to the police or to anyone else, and it does not matter whether or not you have been involved in any other investigation. At a later stage, the inquiry will look separately into the provision of care by the De La Salle Brothers, who ran a number of institutions in Scotland.